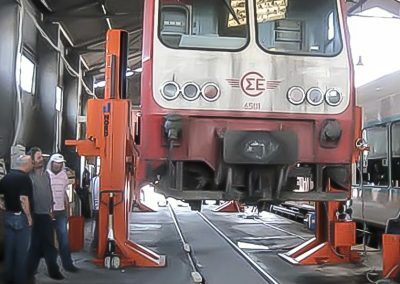 Lifting solution for Railway workshop. 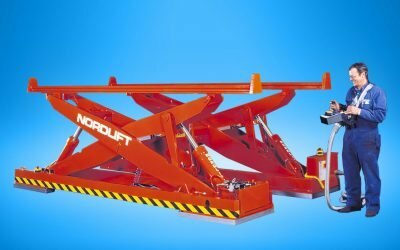 Nordlift quality also in Mechanical jacks. 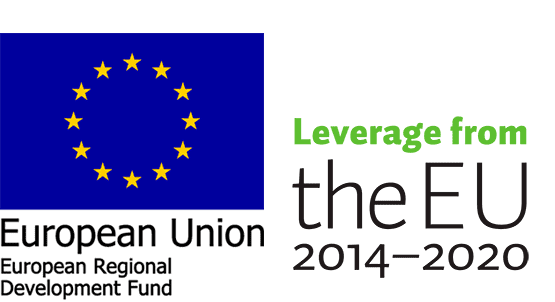 Compact, fast and secure solutions. 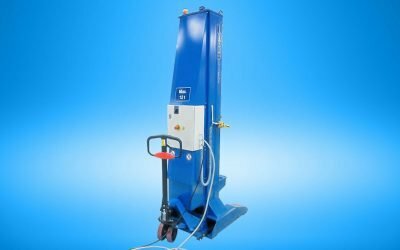 Nordlift TH - electro-hydraulic lifting jacks. First hydraulic lifting jacks in the world - since 2002. 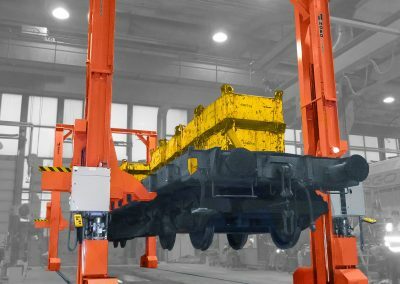 Nordlift bogie handling and bogie transport solutions. Now also available in electromechanical version. 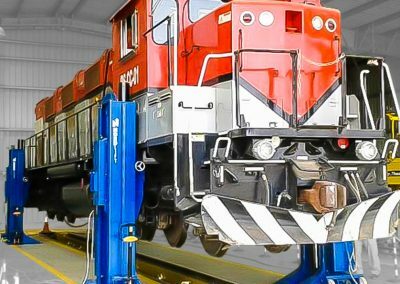 Bogie handling and transport lifts. Nordlift TH -lifting speed is a class of its own compared to the mechanical lifts. In practice, it has been noticed that Nordlift TH lifting jacks do save lot of working time: 1 hour per lifting cycle. At TH version the columns are with an electro-hydraulic power unit of their own. The columns are connected only by a thin cable containing control data and the power supply. No heavy cables laying on the floor. No connection cables under the vehicle itself. No risk for damaged cables. 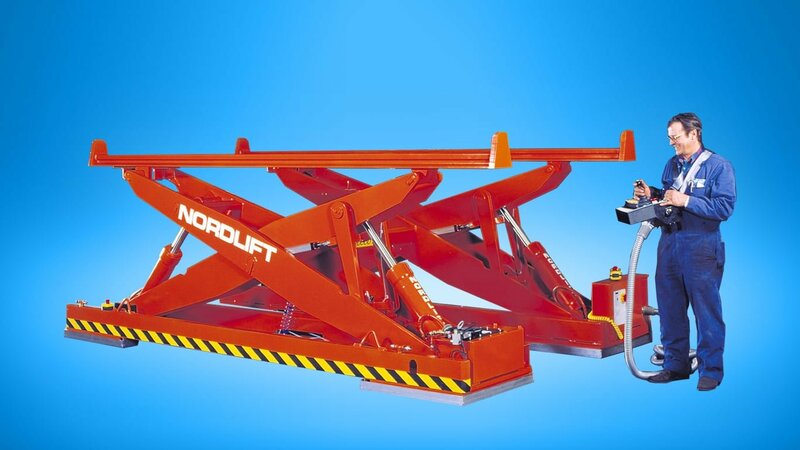 Nordlift TH -with hardly no wearing components compared to mechanical lifting jacks. This means long life cycle and low maintenance costs. One day service per year is sufficient. Nordlift means also quality screw type of lifting jacks. 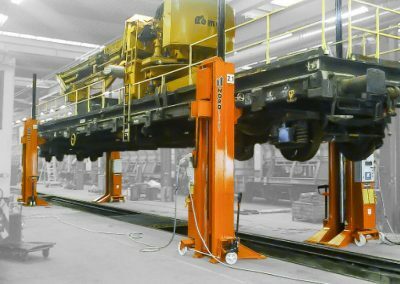 Nordlift TH lifting jack capacity can be, for example, 20 x 20 t = 400 t (train combination), or 4 x 30 t = 120 t (locomotive maintenance). Nordlift Triple Safety System ™ means three time secured, continuous and automatic working safety system. 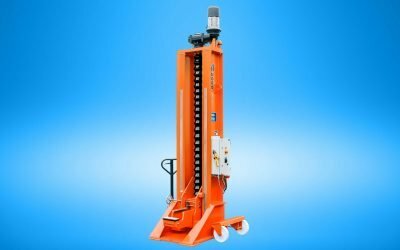 Hydraulic lock valve, an independent working mechanical safety catch system and Parachute valve will keep the lift safely hold up under all circumstances. Nordlift Eco ™ technology allows for nearly 70% less power consumption. TH-column requires only a 1.5 kW - a lifting speed corresponding to the screw jack 4 kW. The result is a significantly lower connected load. 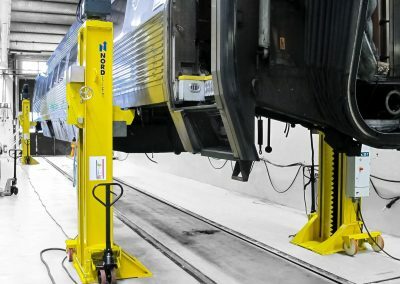 Nordlift Oy delivered to VR's depot in Helsinki a set of lifting jacks from the TH-Series, which was tailor-made for lifting Stadler's trains. 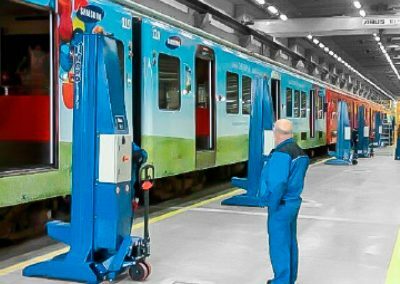 Stadler installers in Helsinki tested the lift and recommended these lifting jacks further for Stadler trains depot in Tallinn, Estonia too. Nordlift is the first manufacturer in the world for electrohydraulic lifting jacks - since 2002. 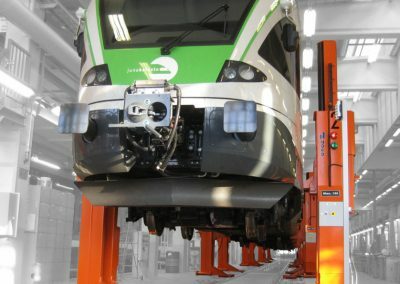 Nordlift electro-hydraulic jacks have been chosen already by a number of railway companies in Belgium, Greece, Estonia, Finland and Senegal. 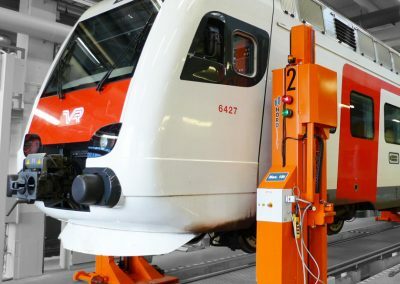 Leading companies trust on Nordlift design and tailor made solutions; Alstom, ABB, Bombardier, Stadler, Valmet Automotive, VR Group and Wärtsilä. 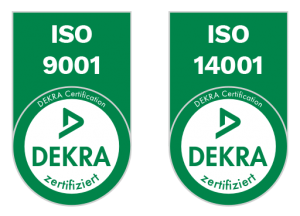 Our products meet the EU quality requirements, and the lifts only use European, high-quality components. Our planning, product development and manufacturing are all located in Sodankylä, in Finland – since 1978. 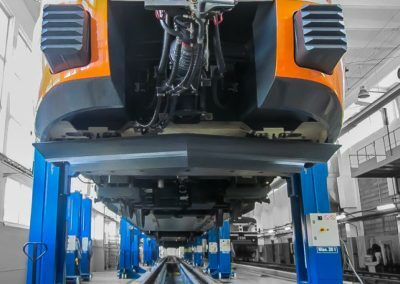 Nordlift tailor-made solutions for the handling of rolling stock bogies.